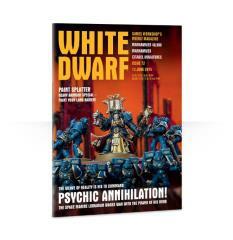 The Librarius has a new tome – White Dwarf 72! Ushered in by the brand new Space Marine Librarian in Terminator armour, this issue brings you a look at the psychic might of the Adeptus Astartes in our Psychic Warfare feature (not to mention rules for the new Librarius Conclave! ), a quite incredible look at the feat of engineering that is Space Marine power armor, new Warlord traits for two of the Imperium’s most loyal (some might say zealous) Second Founding chapters in Theatre of War, ’Eavy Metal, and more. Get one now, before the Librarians catch you sneaking around!